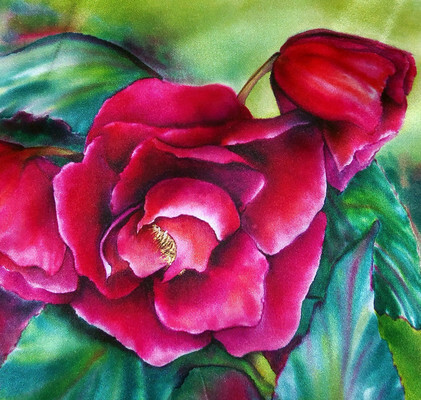 Tina Gleave is a Fine Art Silk Painter. While her vivid and vibrant patterns may be reminiscent of stained-glass or an impressionist painting, her style represents an ethereal and dreamy bliss of our natural world, with its changing seasons and brilliant gardens. Tina studied Art Therapy in college, a time that opened her heart and mind to the possibilities of making her career as an artist. She ultimately earned her Bachelor's Degree in Business Administration at Humboldt State University. While completing her business degree, she also took courses in drawing and painting. Excelling both academically and in the arts with acrylic, oil and watercolor, it was when she took a class within the community that she fell in love with silk painting. Gleave says that she only found her “true art passion” when she discovered silk painting. She continues to find inspiration studying color and light while on garden walks, during trips to the nursery, in Botany classes and while reading. 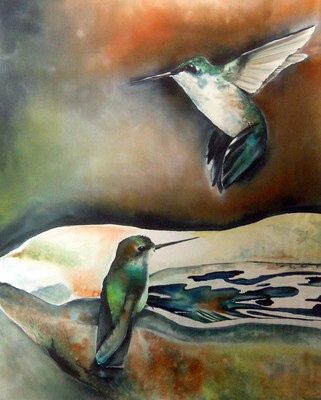 Tina Gleave earned her Master Silk Painting status from Silk Painters International (SPIN). Her work has been shown in several domestic exhibitions, fashion shows, north coast art galleries and has been exhibited in Santa Fe, NM; Cincinnati, OH; San Diego, CA; and Humboldt County, CA. Her painting “Swan Song” won “Floral Artist of the Year” Award with ADC. Gleave is currently working in Textile Fashion Design, bringing her paintings to life on Wearable Art. Her Wearable Art can be purchased at the National Gallery of Art, Smithsonian website and many more boutiques across the United States, as well as her website. She resides in Northern California with her husband and two children. When she isn’t painting in her studio, she travels to teach Silk Painting Workshops and is a Yosemite Artist in Residence.